Selecting and implementing effective basketball plays is one of the most important roles of a basketball coach. Is there a better feeling for a coach than drawing up a play in the dying minutes of a close game that your players go out and execute to perfection and score from? If there is, I haven’t found it. The ability to call the right play at the right time during a game can often be the difference between your team winning a losing. What’s your base offense? – By using basketball plays that begin in the same formation as your base offense, the opposition won’t know that you’re about to run something different! Who are the best players on your team? – Smart coaches will select plays that put their best players in advantageous positions to score. For example, if you’ve got a highly skilled point guard, select a play that puts them in a pick-and-roll position at the top of the key surrounded by shooters. What’s the skill level of your players? – The age and skill level of your players will play a big role in determining which basketball plays will be most effective for your team. For example, you obviously don’t want to use a three-point play for an U10’s team simply because you think the play would look cool. What shots do the basketball plays result in? – It’s important that the plays you implement result in scoring opportunities for different players in different areas of the court. Don’t select plays that all result in your shooting guard receiving a screen on the right wing. Mix it up and ensure you have plays that get the basketball inside as well as plays that result in open outside shots. At the end of close games – There’s no better opportunity for running an effective set play than when your team desperately needs a basketball in the dying minutes of a close game. Call out a play to your players and then watch them execute it. Any out-of-bounds opportunity – An out of bounds opportunity allows your team to quickly bunch up and decide on a play to run. This means the players don’t have to call out the play and alert the other team. They can also look to the coach for guidance on which of the basketball plays they should run. Out of a timeout – Timeouts are another great opportunity to set up basketball plays. In every basketball league in the world, you’ll see smart coaches save their timeouts for end-of-game situations so that they can huddle with their team and set something up. To ‘heat up’ one of your players – Another great use of basketball plays is to ‘heat up’ one of your players. This can be beneficial when one of your star players is struggling to get into the flow of the game. Getting them a good shot and seeing the basketball go through the net can do wonders for their confidence. Teach your players what options to look for – In the basketball plays listed below, many of them have multiple scoring opportunities throughout the play. Make sure that you’re pointing out which scoring opportunities will most likely be open so that your players look for them. Don’t give away your next action – Players shouldn’t start a play facing the exact direction they’re going to run to set a screen. By facing that way, the defenders already know what you’re going to do. Start all of your basketball plays out of the same formation – Not compulsory, but some coaches might prefer this idea. By having plays that start in different formations, the opponents that you play frequently will learn which play you’re in by how your team sets up. If you start all plays in the same formation (a box, for example), then the defense won’t know what’s going to happen next. Use a maximum of 3 – 4 plays for youth teams – This is why you must choose the basketball plays that you implement wisely. Any more than 3 – 4 plays and you’ll be using up too much valuable practice time. If you don’t have much practice time during the season, use less than 3 or 4. If your team doesn’t have any practice time at all, consider not using plays. Save basketball plays for when you need them – I highly recommend memorizing a couple of extra plays and saving them for crucial moments of specific games. For example, it’s always good to have a quick-hitter three-point play up your sleeve for late in games when your team is down by 2. Practice drawing up plays at practice – It’s a skill for players to be able to watch you diagram a play on a clipboard and then step onto the court and execute it. Consider taking a little time out of each practice to make sure your team can do this effectively. Practice the basketball plays against live defense – I see many coaches get frustrated when their team can run the plays perfectly 5 on 0 at practice but then look like they’ve never even heard of the plays during games. You must practice against real defenders if you want the plays to be effective in real basketball situations. Each play includes an overview of the play, key personnel, setup, instructions, and coaching points. This play allows a team to get open looks on the perimeter early in an offensive possession. This happens by running an immediate ‘floppy’ out of the 1-4 set where both guards cut off screens to find open space. This is a versatile play as every player can potentially get a shot out of it. Preferably your 2 and 3 are good shooters. The point guard must be a good decision maker to find the open player. Setup: The play starts in a 1-4 high set. 1. 1 dribbles down the floor and calls out the name of the play. 2. 2 and 3 cut along the baseline with 2 stopping close to under the rim. 3. 4 and 5 turn and trail once 2 and 3 have cut past them. 4. 3 sets a screen just inside the paint as 4 and 5 set screens a foot outside the low blocks on their respective sides. 5. 2 now has the option of using the staggered screen or the single screen. For this example, 2 uses the staggered screen and cuts to the perimeter. 6. Once 2’s defender has passed through the screen, 3 will cut off the screen the opposite side to 2. For this example, 3 cuts off the single screen by 5. 7. After screening, 4 and 5 immediately duck in and look to receive the quick pass for the layup. Often 4 or 5’s defender will be forced to help on the player cutting to the perimeter which leaves 4 and 5 on smaller defenders. 8. The point guard has now had 4 great passing options which lead to quick open shots. 9. If 2 or 3 catch on the perimeter, the closest post player immediately attempts to get a low seal while the other post player clears to the high post to give them space. The players must know who the initial cutter is going to be so that the guards know who must set the screen. The point guard must be a great decision maker at the top of the key. There will be open looks from this play… your point guard must be able to make the pass on time and on-target. One of my favorite basketball plays for catching the defense off guard getting a quick post up. This occurs on a back screen out of a staggered screen to an open block. If the post isn’t open, there’s a staggered screen for a weak side shooter. A great post player at the 5 position. The key goal of this play is to get a quick and clear post up. 2 should be your team’s best shooter. Setup: The play starts in a 3-out 2-in formation with the posts on the elbows and the wing players in the corners. 1. 1 starts the drill by dribbling their defender down one side of the floor to create good screening angle. 2. 3 walks their defender down to the low block. 3. 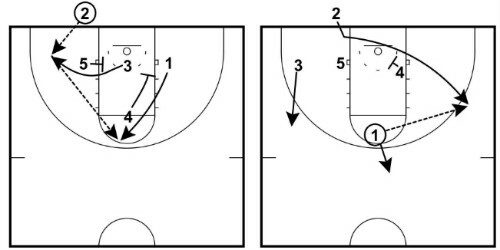 4 and 5 set a staggered screen for 1 as they dribble around the top of the key. 4. As 1 is dribbling off the screens, 3 sprints up and sets a strong back screen on 5’s defender. 5. 5 immediately rolls to the basket looking for the pass for the quick layup. If that’s not open, they establish deep post position. 6. If 1 can’t get the basketball into the post, 3 and 4 set a staggered screen for 2 who cuts to the top of the key ready for the open shot. Start the play with your best shooter on the same side as the best post player. If 3’s defender stays in the key to deter the pass, 3 can pop to the top of the key off a quick screen by 4 for the open shot. UCLA curls allows your team to get open layups at the basket by keeping the lower key open and running guards off screens towards the ring. If the first two players can’t get open, the play ends with a traditional wing pick and roll. 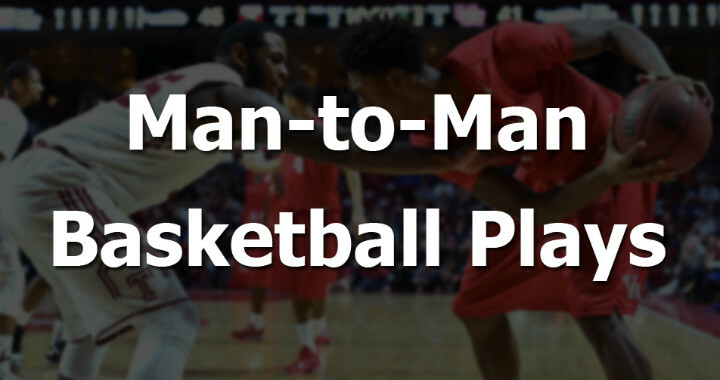 A well-rounded play that doesn’t require any player to have a specific skill-set. The player that receives the basketball on the wing (3) should be able to attack and make good decisions out of the pick and roll. Setup: The play starts in a 1-4 high formation. 1. 1 passes to 3 on the wing. 2. 1 then performs a UCLA cut off 5’s screen looking to receive the pass for the open layup. If it’s not open, 1 clears out to the weak side corner. 3. 4 and 5 then set a staggered screen for 2 who curls towards the ring looking to receive the pass for the open layup also. If they don’t receive the pass they clear out to ball side corner. 4. 4 pops out to the top after screening to create space. 5. 5 then sets a pick and roll for 3 who attacks the rim hard looking to score or create a play for a teammate. This is a great play because it keeps the post defenders out of the paint. On the pick and roll, the only inside defender will be the defensive point guard. The players curling to the rim should be leading with a hand where they want the basketball and calling for it if they’re open. This play involves numerous screens and many open shot opportunities. I recommend this play to high school and older teams because timing, screening angles, making the right play, and being able to shoot from the outside are all very important. Your point guard and shooting guard should be able to consistently make an open outside shot. Your center must be able to set strong screens at the correct angles with good timing and it’s a plus if they have a post game too! 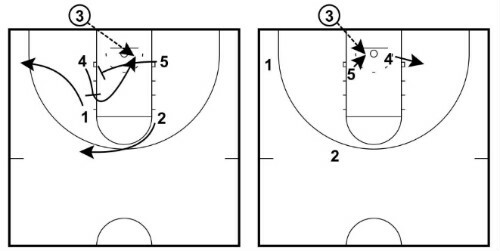 Setup: The play begins in a horns set with your wing players level with the lower blocks. 1. The play starts with 1 passing to either of the two post players on the elbow. Preferably the side with the best shooter on the wing. 2. 1 then cuts down the center of the lane and sets a flex screen for 2. 3. 2 can cut either high or low off the flex screen and looks for the pass from 4 and the easy layup. 4. 5 sets a down screen for 1 for a screen the screener action. 1 cuts to the top of the elbow or slot looking for the catch and shoot. 5. After screening for 1, 5 immediately sets another screen for 2 who cuts out to the wing. 6. If 1 wasn’t open for the shot, they must swing the basketball to 2 who should be open on the wing for the shot. 7. After screening 2’s player, 5 attempts to get a deep seal in the paint. If 2 wasn’t open, they can pass in for the score. The play can be run either side of the floor, but the point guard should attempt to pass to the side of the team’s best scorer. Screens must be set with the correct timing and angles. Shot selection is crucial. Your players must read what the best shot is and be willing to pass up an ‘okay’ shot for a ‘great’ shot. This is a great play for getting a quick three-point shot. The two guards will look like they’re exchanging wings but your best shooter will quickly cut to the top of the key off an elevator screen for the three-point shot. A great shooter on the wing who will run the baseline cut. Setup: The play begins in a 1-4 high formation. 1. The play starts with 1 dribbling towards one side of the court. 2. 3 Iverson cuts off the screens set by 4 and 5 on the elbows while 2 baseline cuts to the middle of the key. 3. Immediately after setting the screens on the elbows, 4 and 5 set a elevator screen for 2. 4. 2 shoots through the screens to the top of the key for the catch and shoot three-pointer. The player who 1 dribbles at will always go over top of the screens. Therefore, 1 must make sure they don’t dribble towards the better shooter. There should be no slowing down by 2 in the key. They must make a quick change of direction and burst through the elevator screen. For this reason, 2 should wait an extra second before starting their baseline cut. 4 and 5 must ‘close the gate’ after 2 has cut through to screen 2’s defender. That’s why it’s important for 2 to quickly change direction and create separation so that the post players have time to step closer. If 4’s defender predicts the pass and cuts it off, 4 should dive to the hoop for the layup. 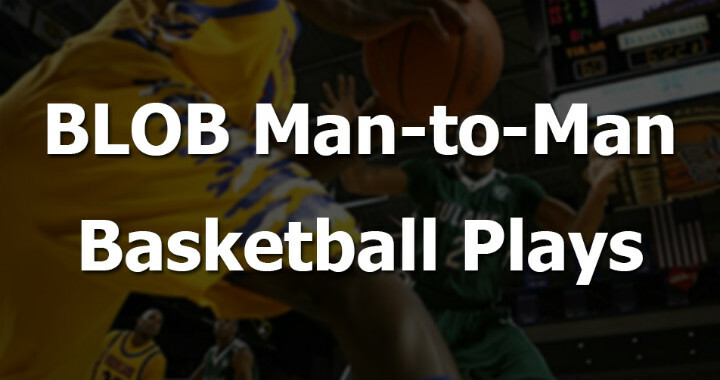 This man-to-man play is named after the initial UCLA cut made by the point guard. The play is designed to get your point guard an open shot on the wing off a double screen while the wing player performs a pick and roll. The point guard (or a player who initiates the offense) must be a good shooter. The wing player that receives the basketball must be a good decision maker and preferably can shoot the midrange shot and also finish at the rim. 1. The play starts with 1 passing to either 2 or 3 on the wing (2 in this example). 2. 1 then makes a UCLA cut off the screen by 5 looking to receive the pass for the layup. 3. If 1 isn’t open on the cut, 5 steps across and sets another screen for 2. 4. As this is happening, 3 and 4 walk their players down towards the weak side low block to set a double screen for 1. 5. 2 uses the screen from 5 and attack the middle of the floor. After the pick, 5 rolls to the rim. 6. As 2 is dribbling off the screen, 1 cuts hard off the double screen from 3 and 4 and gets open for the open shot. 7. 2 now has three options: They can pass to 1 for the jump shot, attack the rim or pull up for the shot themselves, or pass to 5 rolling towards the rim. One of the advantages of this play is that it can be run on either side of the floor. Off the double screen, 1 should cut to a distance that they can shoot from. If you’re coaching a young team, they shouldn’t cut outside the three-point line. Make sure 5 sets the pick and roll screen on the correct angle that allows 2 to attack the rim. X-Cross is a unique play with many scoring options. The name of the play comes from the opening cuts made by the guards. This play is guaranteed to get your team open shot opportunities. • There is no specific personnel needed as there are scoring opportunities for nearly all players. Setup: The play starts in a high 2-3 formation. 1. The play begins with either of the top two guards making a pass to a wing player. For this example, 1 passes to 3. 2. After the pass, 1 and 2 then cut off 5 towards the opposite blocks. 1 should always cut first and then 2 follows. 3 should watch both of these cutters and if they’re open pass them the basketball for the open layup. 3. 4 then cuts to the top of the key using 5 as a screen and 1 pops out to the wing. 4. 3 swing the basketball to 4 who immediately passes to 1 on the wing. 5. Immediately after passing, 3 cuts baseline using a flex screen from 2. 1 must look inside and see if they can pass to 3 for the easy layup. 5. If 3 isn’t open, 4 and 5 set a staggered down screen for 2 who cuts to the top of the key for the open shot. 5 must hold their position on the high post as 1, 2, and 4 use them as a screen. If 5 moves, a moving screen may be called. If possible, the first pass to the wing should go to the player you want coming off the flex screen. A quick hitter to use against a 2-3 zone to get your best shooter an open shot off a flare screen on the wing. 2 should be the best shooter on the team. 1 must be able to make an on-point pass over the flare screen. 5 must be able to set a solid screen. Setup: The play starts in a 1-3-1 formation with a player that can shoot in the corner on the same side as your best shooter. 1. The play begins with 1 take a few dribbles and passing to 2 on the wing. 1 then stays at the top of the key. 2. 5 steps to the strong-side elbow. 3. 2 immediately passes to 4 in the corner. 4. 4 passes back to 2 and begins walking their defender towards the rim. 5. 2 then takes two or three dribbles towards the top of the key forcing X2 to follow in order to deny the open shot. 6. 2 passes to 1 at the top of the key. 7. 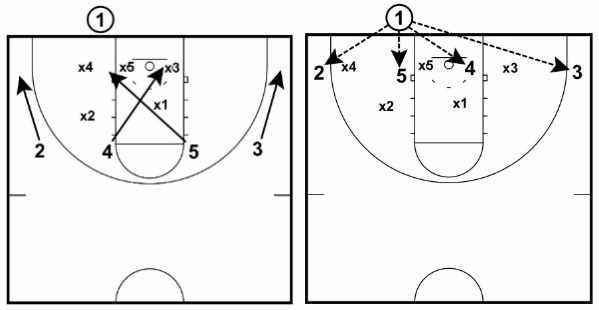 5 immediately sets a flare screen for 2. 8. While this is happening, 4 has walked x4 towards the rim and sets a screen so that X4 can’t contest the shot. 9. 2 uses the flare screen and 1 makes the pass over the top for the open three-point shot by 2. The flare screen set by 5 must be quick so that X2 is caught off guard. This play will only fool the defense once or twice a game so keep it in mind for special occasions where you need a three-point shot. This play is designed to get a backdoor lob for an athletic perimeter player. It involves moving the defense over and then screening the weak side low defender to open a lane for the lob pass and finish. A point guard that can throw a great lob pass. An athletic perimeter player to catch the lob pass and score either by dunk or layup. Setup: The play starts in a 3-out 2-in formation. 1. The play begins with 1 passing the basketball to the perimeter player that will not be receiving the lob pass (2). 2. 2 then dribbles towards the corner to force X3 to defend the basketball. This means X5 will guard 4. 3. At the same time that 2 dribbles to the corner, 3 slides down to the weak-side corner behind the sight of the defense. 4. 2 passes back to 1 on the wing. 5. Having forced the defense to rotate to one side, 5 established position behind X4 and nudges them up the lane to create space on the baseline. 6. 3 then cuts hard to the ring behind the screen from 5 and catches the lob pass from 1 for the easy score. Since this play is designed to catch the defense by surprise, don’t use it more than once or twice each game. Lob basketball plays can be a great way to get the crowd involved. If you have an athletic player that can finish, use this play to engage the crowd! 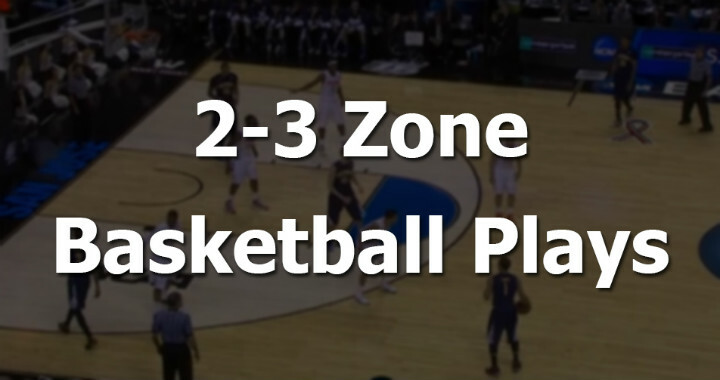 A 2-3 zone play designed to get a shooter an open shot from midrange or the three-point line. The play achieves this by forcing the baseline defender to play the wing and cutting a player baseline to the short corner. • 4 must be able to hit the midrange or three-point shot. • 5 must be able to set a solid screen. Setup: The play begins in a 4 out 1 in formation with the shooter in the corner. 1. The play begins with 1 passing to the wing on the same side as the corner player. For this example, that means 1 passes to 3. 2. 3 immediately passes back to 1 who is now a few steps to the right of the middle of the court. 3. As this is happening, 2 slides up from the wing to create space for 3 to cut to. 4. 3 then cuts all the way across the court under the high zone defenders to the opposite wing. 5. 1 passes to 2 and 2 passes to 3. 6. Since X2 defended 2 at the top, X3 must close out and defend 3 on the wing to prevent the open shot. 7. 5 screens X5 as 4 cuts baseline to the wide open space on the ball-side baseline. 8. 3 passes to 4 for either the midrange shot or the three-point shot. • 5 must not telegraph that they’re going to set a screen or X5 will fight through it early and be able to contest the shot. • 4 must cut hard and quickly along the baseline for the catch and shoot. • If you’re going to use this play, make sure your players work on this shot during practice. This is a quick hitter play for your team’s best shooter. The play starts by moving the defense and then your shooter will run off a double screen and receive the basketball for the open shot. 1 must be able to make a good pass at exactly the right time to the shooter. Setup: Begin in a 1-4 formation. 1. 1 will start the drill by making a pass to the team’s best shooter (2) on the wing. 2. 2 passes back to 1 at the top of the key. 3. 2 immediately makes a deep cut behind the defense as 1 dribbles across the top of the key to create a better passing angle. 4. As 2 is cutting, 3 and 4 set a double screen on D4. 5. 1 then passes to 2 who shoots the open shot. This play can be run on either side of the floor. The shot can be a midrange shot or a three-point shot depending on the skill level and age of your players. This 2-3 zone play is designed to get an open three-point shot on the wing or in the corner by overloading one side of the zone and forcing 2 defenders to guard 3 offensive players. • A point guard (1) with good decision-making skills. Should be able to hit a floater or midrange pull-up. • Two players that can make the three-point shot at a high percentage – (2) and (3). Setup: The play begins in a 1-3-1 formation. 1. The play begins with 1 dribbling to either side of the floor to drag the high defender in the zone X1 to the wing. 2. At the same time, 3 slides down towards the corner to give 1 more space on the wing. 3. 5 steps out from the high post and screens X1. 4. 1 uses the screen and attacks the high post. If X2 doesn’t slide across to stop dribble penetration, 1 can finish with a floater or midrange pull-up. 5. At the same time that 1 uses the screen from 5, 3 deep cuts along the baseline to the opposite corner. 6. If X2 does stop dribble penetration (as we expect they will), 1 passes to 2 on the wing who should be wide open for the three-point shot. 7. As X2 stopped the drive, the only defender that can contest 2’s shot is X4. If X4 does sprint out to contest the shot, 2 passes to 3 on the baseline for the open three-point shot. 8. On the shot 1 immediately retreats and plays safety. • It doesn’t matter which side of the floor this play is run on since both wing players will be in shooting positions. 4 on the baseline can start on either side but must go to the ball-side when the ball is reversed. • 5 and 4 must rebound on the shot. This is a quick hitter designed to get a good shooter an open three-point shot from the corner off a skip pass. Due to the skip pass, this may be hard for young teams to execute, but high school teams and older will find a lot of success using this play. • 3 should be able to make a strong skip pass. • 2 should be the team’s best three-point shooter. Setup: Your team starts in a 1-3-1 set with the low post player on the same side as your best three-point shooter. 1. The play begins with 1 passing to 3 on the wing. 2. 5 sets a screen on the back side of D4. 3. 2 slides down to the corner behind 5’s screen. 4. 3 makes the strong skip pass to 2 for the shot. • When 5 sets the screen on the back side of D4, they need to make sure they don’t do it until the pass is about to be made. If they do it too soon, the defense will instantly know what’s happening and can fight through the screen. • To make sure the ball isn’t tipped, 2 should through an overhead pass. Make sure to practice this with your team at practice! This play is designed to get a blindside pick-and-roll for your point guard at the top of the key. After using the pick-and-roll, the point guard has a number of options to give your team in the best opportunity to score. 1 must be a great decision maker. 5 must be able to set a strong screen. 3 must be able to knock down the three-point shot. Setup: Players start in a 1-3-1 formation with your best decision maker running the point guard position. 1. 1 passes to 2 on the wing to shift the defense. 2. Once the defense shifts, 2 passes back to 1 at the top of the key. 3. As this pass is made, 5 sets a blindside screen on D2. 3. 1 immediately uses the screen and attacks towards the rim. 4. As 1 is driving off the pick-and-roll, 3 slides down to the corner and 4 slides along the baseline to find a hole in the defense. 5. 1 now has three scoring options depending on what the defense does. Option 1 – If no defender steps up to stop the ball, 1 pulls up for a jump shot. Option 2 – If D4 steps out to defend, 1 passes to 3 for the corner three-point shot. Option 3 – If D5 steps out to defend, 1 bounce passes to 4 for the baseline layup. 5 must set the screen on a good angle so that 1 can attack the rim. A lot of youth players set the screen on the side of the defender and they easily slip under it. 3 and 4 must be down in stance ready to catch and shoot when they receive the pass from 1. From a 4-low formation, the ball is passed to the middle players at the top of the key. The play then involves a flex screen and pin down which provides two great open shot opportunities. Best shooter should inbound the basketball. Best post player should start outside the three-point line on ball-side. Setup: The play begins in a 4-low formation with the bigs on ball-side. 1. 4 cuts to the top of the key and receives the inbounds lob pass. 2. 3 waits an extra second and then cuts to the top of the key and receives the pass from 4. 3. 2 then steps inbounds and sets a flex screen for 5 who flex cuts looking for the pass and open layup. 4. We then use a screen-the-screener action as 4 sets a pin down for 2. 5. 2 cuts to the top of the key looking for the catch and shoot from a pass from 3. 3 must be able to make smart decisions with the basketball and hit the open player at the right time and on-target. It’s important that every player sets strong screens during this play. The play begins in a box formation and involves your best shooter setting a simple back screen for a center to get open for a quick layup. The screener then uses a gate screen to open up a catch and shoot from the wing. The play finishes with an open post up by the center. Best shooter should start on the weakside low block. Best post-up player should start on the weak-side elbow. Point guard should inbound the basketball. The play begins in a box formation. 1. 2 sets a back screen for 5 who cuts to the rim looking for the basketball. 2. As 2 sets the screen, that’s when 3 starts to move up the side of the key. 3 can’t move too early or the defense will read the play. 3. Immediately after setting the screen for 5, 2 sprints through a gate screen set by 3 and 4 looking for a catch and shoot on the wing. 4. After screening, 3 and 4 clear out to the top of the key. 5. 1 steps inside the court and sets a cross screen for 5 who looks to duck in for the pass or post up on the ball-side low block. The reason the point guard should inbound the basketball is so that the help on the cross screen is a small defender. 3 must wait until 2 is ready to sprint off the gate screen before moving. They should arrive at the same time. 1 must make the pass to 2’s inside shoulder. If they pass to the outside of their body, it will be difficult to catch and shoot. A super simple gate screen play off a baseline inbounds. The shooter passes the basketball in and then walks to the middle of the key where they’ll receive a gate screen to one side of the floor and a normal screen to the other. Your best shooter should be inbounding the basketball. Setup: The play starts in a box formation with the shooter inbounding the basketball. 1. The play begins with 4 stepping off the low block to receive the pass. 2. 4 then swings the basketball to 3 who immediately passes to 1. 3. By this time the shooter (2) has walked their player into the middle of the key. 4. 4 and 3 then set a gate screen on the low block which 2 sprints through to get open for the shot. 5. It’s 1’s responsibility to use the dribble to improve the passing angle. 6. If the defender cheats the gate screen, 5 sets a screen on the opposite low block which the shooter can use also. The gate screen provides the primary scoring opportunity. Only after you’ve run the play a few times and the defender cheats should the shooter look to use the single screen from 5. This is a great play for youth basketball due to its simplicity. The shooter should give a small ‘nudge’ to their defender before cutting through the gate screen to create separation. This must be taught to the players so that they’re not called for a pushing foul. This play is designed to get great open midrange and three-point shots around the perimeter. If none of the shots are open, the team can either post up one of the bigs or set a ram screen for the perimeter player. This play works best if 1, 2, and 3 can hit an open outside shot. 2 should be the team’s best creator out of a pick-and-roll. 5 should be your team’s best post player. 4 should be your team’s best screener. Setup: The play begins with one player on the free-throw line and 3 players lined up on and between the low blocks. If any of these shots are open, the player should shoot it! 1. The play begins with 5 setting a screen for 3 pops out to the corner. 2. A second later (timing is important), 4 sets a down screen for 1 who cuts to the top of the key. 3. 4 then immediately sets another screen for 2 who cuts from the inbounding position to the wing. 4. As 2 catches on the perimeter, 4 will set a final cross-screen for 5.
a. 5 can receive the quick pass inside for the layup or post up on the low block. b. 5 can sprint up and set a screen on 2’s defender and we’re now in a pick and roll with fantastic spacing. The final screen is called a ‘Ram Screen’. It’s effective because 5’s defender will be trailing the play after being screened by 4 which will mean there’s no defender to show on the screen which leaves 2 open for the shot or driving to the rim with a post defender closing out late. All players must be looking to catch and shoot on every catch. They’ll all be coming off screens so some will be open! This play starts in a box set and has numerous scoring opportunities including a shooter cutting off a double-screen for the shot, a post player diving to the rim, and a pick-and-roll with great spacing if none of the first two options are open. Your best shooter should start on the weak-side elbow. Your best pick-and-roll player should inbound the basketball. The post player that you want to screen on the pick should start on the ball-side low block. Setup: The play begins in a box formation. 1. 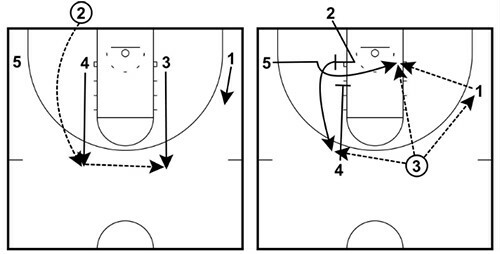 The play begins with 5 sliding to the high post and setting a double screen with 4. 2. 2 curls tight off 4 and 5’s double screen looking for the catch and shoot on the wing. 3. If 5 notices their defender helping, they duck to the rim for the layup. 4. 3 takes a few steps towards the rim and the pops out calling for the basketball to draw their defender out with them. 5. If no immediate scoring options are open, 1 inbounds the basketball to 2. 6. 4 and 5 immediately set a staggered down screen for 1 who cuts to the top of the key. 4 should ensure not to be too close to 5 on this staggered screen. 7. 2 takes a couple of dribbles and then passes to 1 at the top of the key. 8. 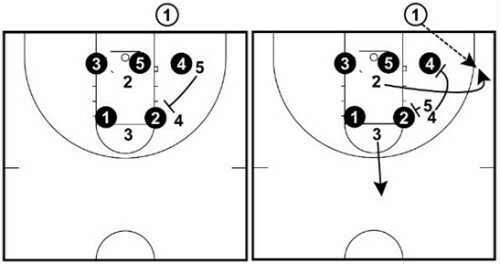 4 immediately sets a screen on 5’s defender and 5 sprints to the top of the key to set the screen for 1. 9. 4 slides down to the weak-side short corner and both wing players create the best angles possible for the drive and kick. 10. 1 uses 5’s screen and attacks the rim looking to score or dish off to an open shooter after reading the help defense. The point of screening for the screener is to create a lot of space for 1 to attack without the screener’s defender hedging or trapping. Preferably, 1 should catch on the ball-side slot to give them more room off the pick-and-roll. Strong screens are very important during this play. Don’t allow your players to be lazy. Set and hold until the defender fights through. One of the best basketball plays out of the common stack set to get your best shooter an open midrange or three-point shot on the wing. Your best shooter should be in the position of 2. 1 should be your point guard. Setup: The play starts in a stack formation with the exception of the point guard (1) who is on the weak-side elbow. 1. The play begins with 4 popping out to the perimeter and receiving the pass from 3. 2. As this happens, 2 drags their defender lower by taking a few steps towards the hoop and calling for the basketball. 3. After inbounding, 3 sprints the baseline and clears out to the weak-side wing. 4. 1 cuts to the top of the key and receives a pass from 4. 5. 1 should take a dribble in the opposite direction to get the defenders moving towards the middle and to open up the pass to 2. 6. 4 and 5 immediately set a staggered screen for 2 who reads their defender and cuts out and receives the pass from 1 for either the midrange or three-point shot on the wing. It’s important for 1 to sell the fake dribble towards 3 at the top of the key to get the defense moving across. At the beginning of the play, players shouldn’t face the direction they’re going to go or they’ll give away their movements. The aim of the play is to get the basketball inside to one of the two post players. The play does this by using a screen-the-screener action. The two guards move to safety positions and keep their defenders occupied. Best used on a team with great post players. Can also be used for any player that has a height advantage against their direct opponent. The best passer should pass the basketball in. Setup: The play begins in a box formation with the two posts down low and two guards at the high post elbows. 1. The play begins with 4 setting an up-screen for 1 who pops out to the corner. 2. As 1 is cutting to the corner, 2 cuts to the ball-side slot calling for the basketball to keep their defender out of the paint. 3. 5 waits for one to two seconds while facing 2 and then cuts across the lane to set a strong screen on 4’s defender. 4. This screen-the-screener action should allow 4 to cut to the weak-side of the rim for an open layup. 5. If 5’s defender cuts off the pass, 4 should back out to the short corner to open up the paint for 5. 6. After screening, 5 seals 4’s defender and pivots towards the hoop where 3 should be able to pass to them for the open layup. 7. If no options are open, 3 passes over the top to 2 and the team sets up the half-court offense. 1 and 2 must call for the basketball while cutting even if they know they won’t receive it. It drags the defenders away. 5 must start the play by looking in 2’s direction so that the screen-the-screener action isn’t given away. The play is designed to get your team an open three-point shot in the corner by catching the low ball-side post player off-guard. The ball gets to the top of the key, a quick flash from the weak side, and then a pass to the corner to the in-bounder off strong screen. A player capable of setting a strong screen on the ball-side low block. Preferably a good decision-maker on the weak side low block. Setup: Players start in a wide box set. This means that instead of being on the low blocks and elbows, players are approximately 3 feet wider than usual. 1. The play begins with 3 popping out to the wing and catching the pass from 2. 2. 1 also cuts to the top of the key in case it’s easier to use an extra pass before feeding the basketball inside the key. 3. On 3’s catch, 4 immediately flashes to the middle of the key to receive the pass. 4. 5 will set a screen on the low ball-side post player and 2 will curl around to the corner to catch the pass from 4 and take the three-point shot. 5. If x3 does get around the screen, 5 will be open for the bounce pass and layup as x5 is forced to defend the player in the middle of the key. This is one of the basketball plays where we catch the defense off-guard, it’s not going to work if you run it too regularly. Save it for special occasions. It’s very important that 4 is able to make the read on x3 and then deliver the correct pass to 2 or 5. If 5 does get the catch inside, they must go up strong because x5 will usually turn around and foul. 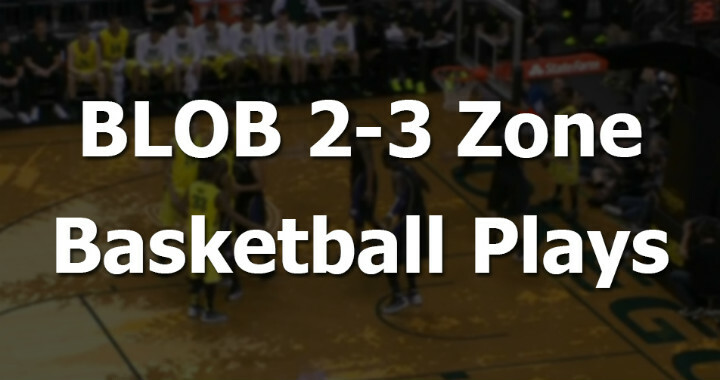 This is a 2-3 zone BLOB box set with multiple scoring options. This set overloads a side of the zone and forces the zone defense to make a decision on who to guard. Great play for teams of all levels! A strong shooter (2) who can make the three-point shot or mid-range shot at a high percentage. A post player who can shoot the basketball from the outside is preferable (4). Put your best playmaker in the (3) position. Setup: The play begins in a box formation. Post players are positioned on the two low blocks and your guards are positioned on the two elbows. 1. 5 sprints up to the wing and 2 enters the ball in-bounds to 5. 2. 1 pops high to the slot and 3 moves down to the block with 4 to set a double screen. 3. 2 steps on the court and positions themselves in the ball-side short corner. 4. 5 passes the ball to 1 at the top of the key. 5. 2 then sprints off the double screen from 3 and 4 to the corner. 6. 1 dribbles to the top of the key to improve the passing angle and makes the pass to 2 in the corner for the open shot. 7. If 2 isn’t open for the shot, 3 flashes to the high post and 1 passes the basketball to 3. 8. 4 then sets a back screen on the bottom wing defender and 5 sprints backdoor looking for the open pass and layup. 9. 4 pops out to the wing after setting the back screen and is then open for a three-point shot depending on how x4 decides to play it. 10. If 3 feels like they have a speed mismatch against x5, they can also attack the rim from the high post. 1’s pass to 2 in the corner must be on-time and on-target. Ensure this is a pass you’re practicing often at practice. Put your best playmaker in position #3. The decision made from this spot will often decide whether your team gets and open shot/layup or not. Teach your players what option will be open depending on how the defense guards them. Emphasize to player 4 on setting a good back screen and also be shot ready when popping after setting the back screen. This baseline out of bounds play is one of the best basketball plays for teams. It’s simple, easy to remember, and effective. The theory behind the play is to get 4 offensive players low and force 3 defenders to guard 4 players. As long as the spacing is even, someone must be open. Two players who can knock down the open three-point shot (2 and 3). Two players who can finish strong inside (4 and 5). One player who can read the situation and make the correct pass (1). Setup: The play starts in a 1-4 high formation. Post players are at the elbows, and two best shooters on the wings. 1. The play begins with 2 and 3 cutting to their respective corners calling loud for the basketball. This will draw out both bottom wing defenders. 2. 4 and 5 wait a second and then cross paths and cut to opposite low blocks. 3. 1 then reads where the defenders moved to and passes to the open play for the shot. If one of the shooters does receive the pass and takes the shot, the opposite corner must immediately sprint back on defense to prevent the fast break. I always advise the in-bounder to look at the player cutting to the opposite corner at the start of the play. The ball-side low player will nearly always deny the corner pass, but it’s the weak-side low player we need to move out of position before the post players can get open. All players must be calling loud for the basketball. This will draw the defenders. The inbounder can’t give away where they’re going to pass the basketball with their eyes. This is a 2-3 zone BLOB 1-4 high set that moves the defense from side to side and creates an advantage with a double flare screen for the inbounder on the weak side out of sight of the zone defenders. A strong shooter (2) who can make the three-point shot at a high percentage. Post players (4) and (5) who are capable of making a strong skip passes. Setup: The play starts in a 1-4 high formation. Post players should be on the wings of the 1-4 high. Best shooter is the in-bounds passer. 1. 5 sprints to the strong side corner. 3 sprints to the strong side short corner at the same time. 2. 2 enters the ball in-bounds to 5 in the corner. 3. 5 skip passes the ball opposite to 4. 1 can also screen in on x1 in order to make this pass easier and safer. 4. 1 spaces up to the top of the key when 4 receives the skip pass. 5. 3 sprints up to flare screen the top zone defender (x2). 5 screens in on the bottom wing defender (x3) at the same time. 6. 2 sprints behind the bottom wing zone defender (x3) and positions himself on the wing. 7. 4 skips the basketball to 2 when as they’re arriving to the wing. 2 should have an open three point shot. 5 can also dribble to the wing to make the skip pass to 4 easier. 3 and 5 can also slip the flare screens and show themselves to 4 if the wing defenders fight over the flare screen. 4 can also use a pass fake to shift the zone away from where 2 is cutting to. Timing of the screens is very important. 3 should arrive to screen near the same time the skip pass is thrown so that the skip pass isn’t given away too early. This 2-3 zone quick hitter BLOB play results in either an open three-point shot in the corner or a post player shooting an open jump shot from the low block. 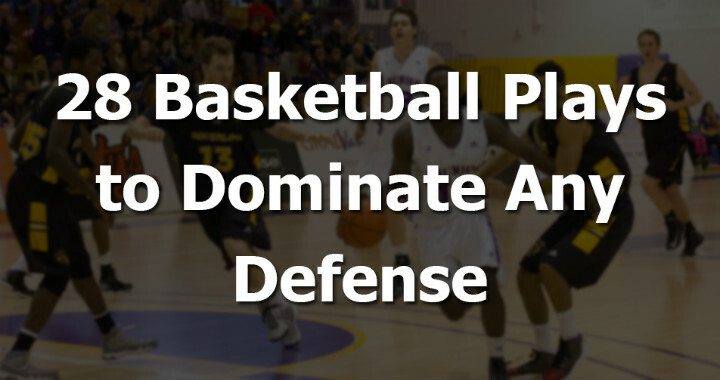 This occurs by forcing the low zone defender to make a decision on who to guard. A strong shooter (2) who can make the 3-point shot at a high percentage. A post player (4) who can make a midrange shot close to the basket. A player who can set a strong screen (5). Setup: Players begin in an irregular formation with 3 players along the free-throw line extended and one player in the ball-side corner. 1. The play begins with 5 cutting down the key and sealing the middle zone defender (x5) with a screen. 2. At the same time, 4 walks their defender (x3) closer to the basket with a screen. 3. 2 cuts towards the ball-side corner and should be open for the pass and shot if 4 and 5 have done a good job of sealing their opponents. 4. 1 cuts to the ball-side slot to force the ball-side guard defender (x1) to hold their position. 5. If x3 cheats over the screen to deny the corner shot, 4 should be open for the catch and shoot midrange jump shot. Timing is very important during this play. 4 and 5 should be setting the screen at the same time and 2 must immediately cut to the corner for the shot. 2 must not make it obvious that they’re going to cut to the corner. Face the middle of the floor and they can even make to set a screen before cutting there. This quick hitter won’t work if you’re running it every time you have a baseline inbounds. Save it for a special occasion where you need a three-point shot. The player inbounding the basketball must make the correct read and pass. This is a 2-3 zone BLOB set designed to get your best shooter an open shot on the strong side corner. The play works by screening the two side defenders in the zone in a creative way. Your two post players to set strong screens (4) and (5). Setup: Begin in a box formation that’s pushed closer to ball-side. Your 4 and 5 must begins on the outside of the two zone side defenders. 1. 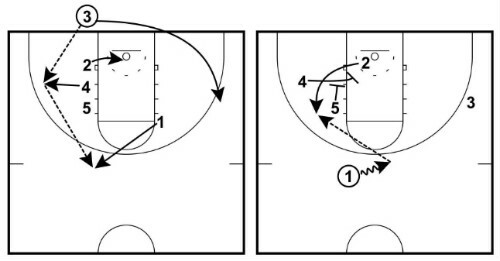 5 sprints up and sets a screen on the top wing defender (x2). 2. 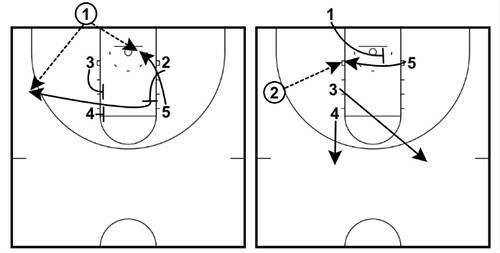 4 runs off the screen and sets screen on the bottom wing defender (x4). 3. When 2 sees that 5 has just set the screen on x2, 2 will then sprint off 4s back to the corner preparing to shoot. 4. 1 passes the basketball to 2 in the corner for the three-point shot. If x2 goes under the screen from 5 to jam 2 from going through the elevator, have 2 go over top of the screen to the corner. If the side defenders fight over top of the screens, use 3 as a safety option over the top and also teach 4 and 5 to slip their screens and show themselves to the in-bounder. 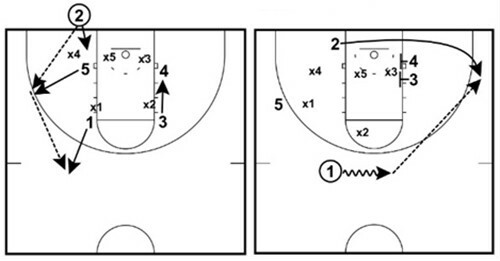 4 and 5 should not start the play by facing where they’re going to set a screen. Don’t give the play away. A basic BLOB 2-3 zone basketball play that’s incredibly common (and successful) at the youth basketball level. It involves clearing out two of the low zone defenders and creating a gap for a player to receive the pass for a quick midrange shot. A post player (4) able to cut into the gap and make a short midrange shot. Setup: Players are set up in a stack formation on the ball-side edge of the key. 1. 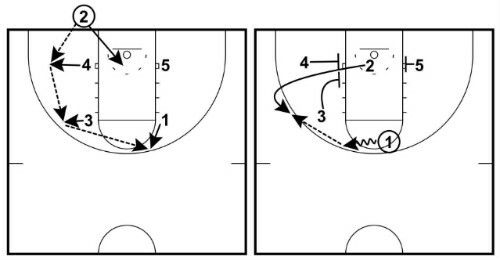 2 immediately cuts to the corner calling for the basketball to drag out the low wing defender (x3). 2. 5 steps towards the middle of the key and sets a screen on the middle zone defender (x5). 3. This leaves a gap for 4 to step into and receive the pass from 1 for the open shot. 4. 3 must clear out to the top of the key to drag out the top defender (x1) and for safety. 5. If x3 does stay and cut off the pass to 4, that will leave 2 open in the corner for the catch and shoot the three-pointer. As always, timing of the screens and cuts is crucial for the play to be successful. 4 needs to wait for the gap to open up before stepping up and calling for the basketball. 4 must have their hands up and be ready to catch and shoot quickly. There’s not enough time to take a dribble or lower the basketball. Very important that 2 is calling for the basketball as they cut to the corner to drag the defender out with them. 1 must read x3 and then make the correct pass to the open player. Since they will be forced to guard two players, one of them should be open.